The Toyota Rav4 being winched out of the monsoon drain at Jalan Lintas. KOTA KINABALU: A young couple were killed when their Toyota Rav4 plunged into a monsoon drain along Jalan Lintas, near Taman Kendara, here early yesterday morning. The driver of the car, Liu Teck Soon, 22, from Penampang, and his front seat passenger, Joan Chai Chiew Ling, 19, from Likas, died instantly in the 12.30am incident on July 20. 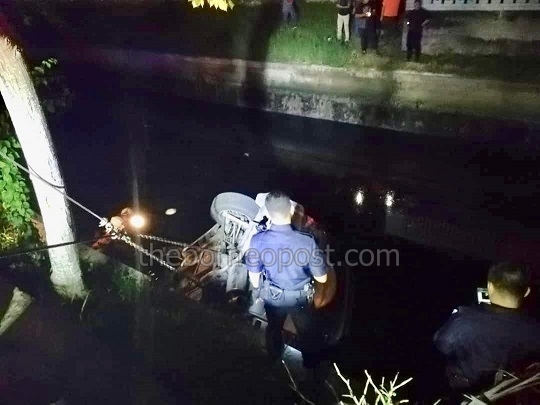 Acting police chief Superintendent George Abd Rakman said it was believed that based on initial police investigation the driver had accelerated his vehicle causing it to move forward in high speed and plunged into the drain. Tow trucks were called to pull the car out of the drain and paramedics at the scene confirmed the victims were dead. Their bodies were taken to the Queen Elizabeth Hospital for a post-mortem and both family members have been notified of the incident. Previous ArticleEnough with politics, can we get down to work?